The biblical, cross-cultural insights in this book will help you build a marriage that is rewarding and joyful, one that brings joy to you and to those around you. That’s because it shows you how do the most important thing in a marriage—to center it in the Lord. Doug Britton, M.Ed., MFT. LifeTree Books. Paperback: 5½ x 8½. Wire “spiral” binding. 158 pages. How will reading Making Christ the Cornerstone help us change? Is Making Christ the Cornerstone only for troubled marriages? Nope. It is for every kind of marriage, great to not-so-great. Whatever your situation, you will find practical insights and tools that will help your marriage flourish and grow. Is this book for new marriages or long-time marriages? Its practical, Bible-based advice will strengthen and bless your marriage, whether you are newlyweds or you have been married for decades. Yes. Since it is based on the Bible, its truths apply to every racial and ethnic group. When you place your order, you can choose a multicultural cover or an African-American cover. Can we use this marriage book for a small group study? What are some topics covered in Making Christ the Cornerstone? What if my spouse won’t read this book with me? It’s ideal if you both read this book. However, if your spouse doesn’t want to join you, don’t say, “I’ll read it, but only if you will.” Instead, learn how to be the best husband or wife possible. God can perform miracles in your personal life—and in your marriage—even if you study on your own. Why do so many marriages have problems? That’s a great question. After all, most marriages start out with two people who are certain they can craft a wonderful union. Yet as the years go by, many never experience the passionate, joyful life they expected. 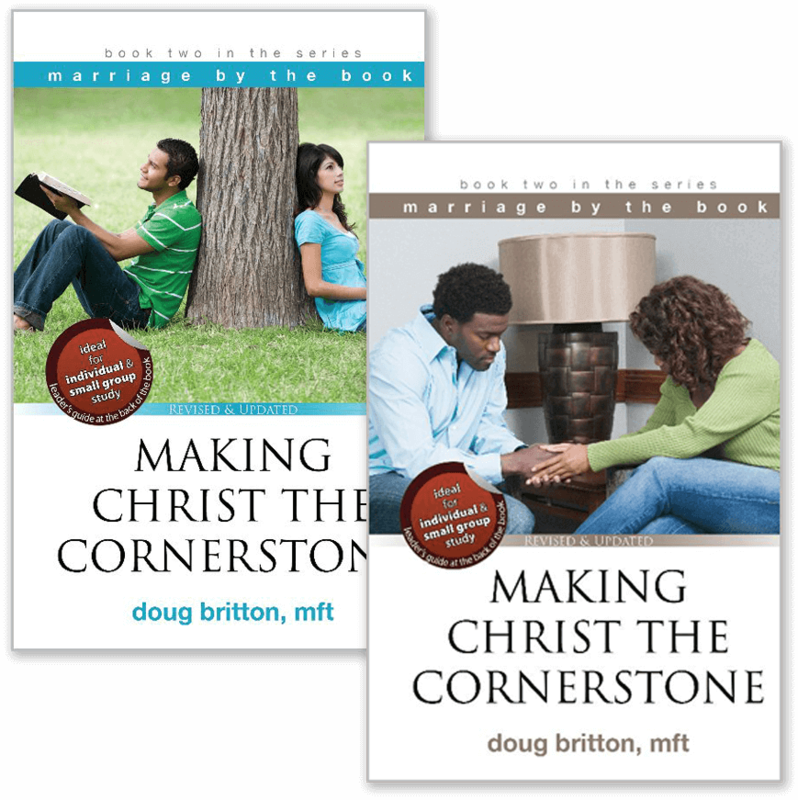 After helping approximately 1,000 marriages, Bible-based Marriage and Family Therapist Doug Britton says a key reason is that most people do not know the Bible’s instructions about how to create a great Christian marriage—or they don’t know how to apply the instructions. Why do readers say they like Making Christ the Cornerstone? It is practical, cross-cultural, and Bible-based. Text is broken into small, easily-digested portions. Points are clearly identified with headings, bullets, and check boxes. The writing style is direct and straight-forward. Real-life stories and examples illustrate key points. “Make it personal” questions help them apply what they read. Each chapter is summarized at the end of the chapter. Wire binding makes it easy to write in the book. AUTOMATIC 20% DISCOUNT for orders over $50.